Today I would like to show you around my favorite district in Tokyo – Asakusa, but let’s start from the beginning, how big Japanese cities look like. Their layout is very different from European cities, where in the central part there is usually a main square or old city. Tokyo, largest metropolis in the world is divided into 23 districts, and the most popular ones are: Shibuya, Shinjuku, Akihabara, Harajuku, Ginza and Asakusa. Each district has its own unique character, its own ‘center’, which is usually the main street and its surroundings. There are the biggest attractions and the largest crowds. Akihabara is an electronics district, where we find a lot of larger and smaller stores with the latest electronic equipment or old electronics, such as Polaroids or Nintendo. Harajuku is a district of young people who like to dress and stand out from the crowd in a colorful way. There are clothing stores, small charming cafes, hairdressers and stylists. Ginza is a very elegant and expensive district, there are the world’s largest designers there, and the land in Ginza is the most expensive in the world. Most of these districts are very modern places, while Asakusa still has the charm of old Japan. When I am in Tokyo, I feel best in Asakusa. Districts such as Shinjuku or Shibuya, full of high skyscrapers and advertising screens are overwhelming me. Crowds of people are always rushing there, we can feel all that rush and nervousness. Asakusa is also crowded, but the atmosphere of this place is completely different, more calm and traditional. It is one of the most popular tourist places in Tokyo, which is located in the north-eastern part of the city. Asakusa belongs to the so-called Shitamachi, meaning “the old heart of town” and you can really feel the atmosphere of a bygone era there. The Sumida River flows right next to it, on the other side there is the Sumida district, where is the newest Tokyo symbol – Skytree and the Japanese beer Asahi building. 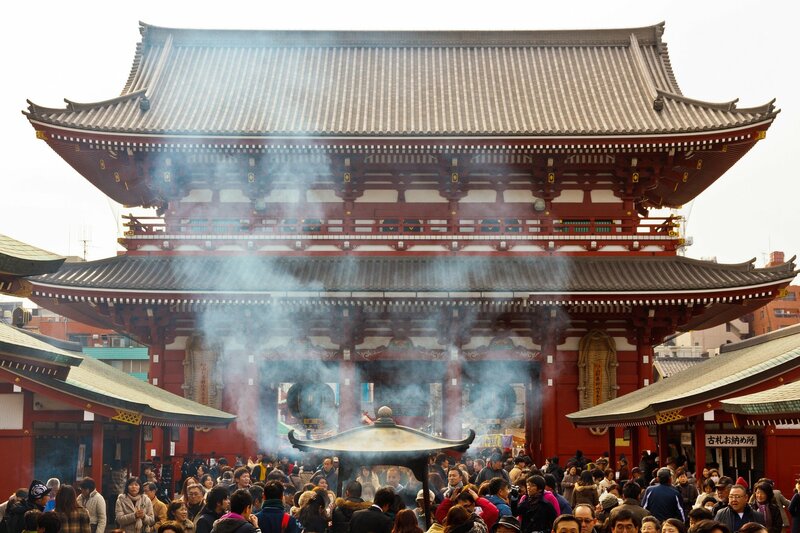 In the very center of Asakusa, there is the biggest attraction, Senso-ji. This ancient Buddhist temple is the oldest temple in Tokyo and is visited by 30 million people each year. The entrance to the temple is marked by the Kaminari-mon Gate, from which a huge paper lantern hangs. 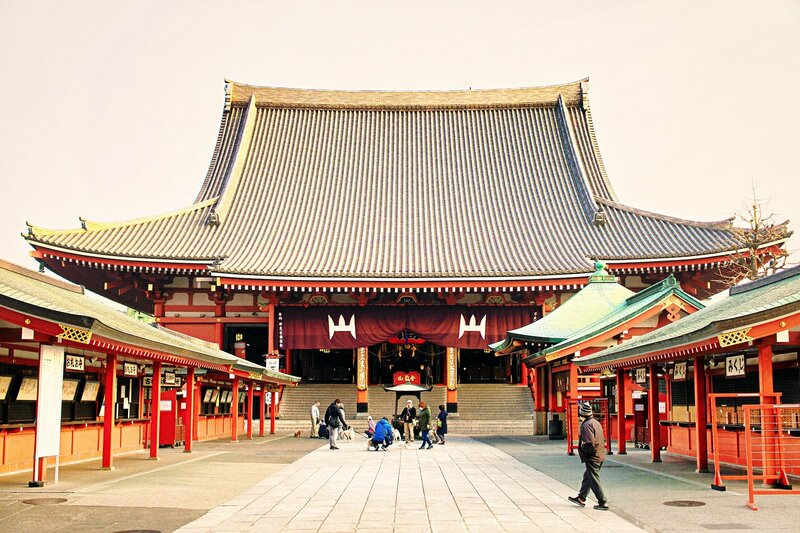 Through Kaminari-mon we enter one of the oldest arcades in Japan – Asakusa Nakamise Shotengai. 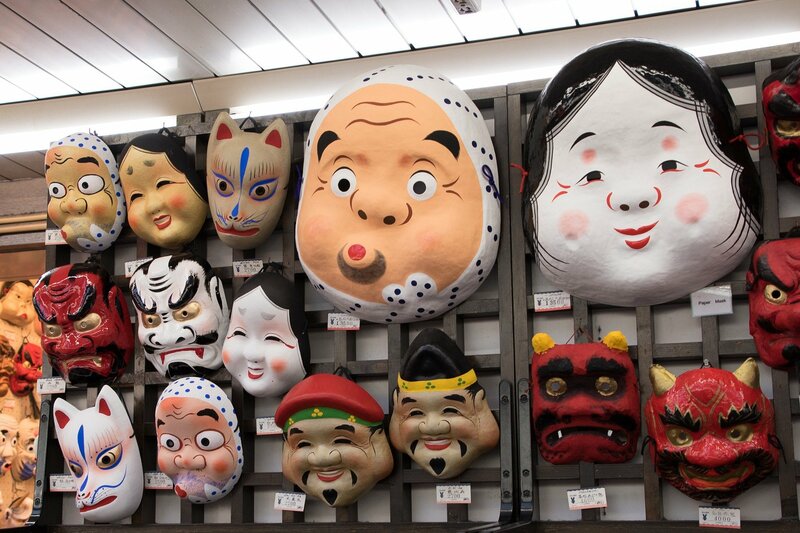 There are more than 50 stores where you can buy traditional Japanese snacks, sweets and souvenirs. At the end of Nakamise Shotengai there is another gate leading to the temple – Hozomon Gate. Then we enter the area of Senso-ji, where the main building and several smaller ones are located, in which we will buy temple accessories, incense and amulets. The Nakamise Shotengai shops close quite early, the main temple building also, which is why the place begins to be empty. This is the time when we have chance to see the pictures on the shops shutters. They depict scenes from the old life in Asakusa. The stores are closed, but the nightlife centers – Izakayas open up. You can compare them to bars or pubs, but they are much better. You will not only drink alcohol in them, but also fill the belly with delicious food. Snacks ideal for beer, hot or cold sake. Forget about sticks, nuts or chips. In Japan, edamame, yakitori and other delicacies are eaten with beer. Often there isn’t English menu in such places so if you don’t speak Japanese you don’t know what you order. In my opinion, this is an additional attraction and adrenaline. As you can see, the buildings in Asakusa are low and old-style. This creates the climate of old times, although the symbol of our times – Skytree, lurks in the background. Asakusa was once a district of red lighthouses and it is still lit by old-style lanterns. It is also a place where people came to have fun. There were many kabuki theaters, and street performances were organized on the streets. Here and there to this day you can see traditional Japanese performances, such as rakugo. You just need to know where to go, because theaters are often located in small, inconspicuous houses. An example may be Asakusa Engei Hall, where famous Japanese actors such as Takeshi Kitano put their first steps as comedians. 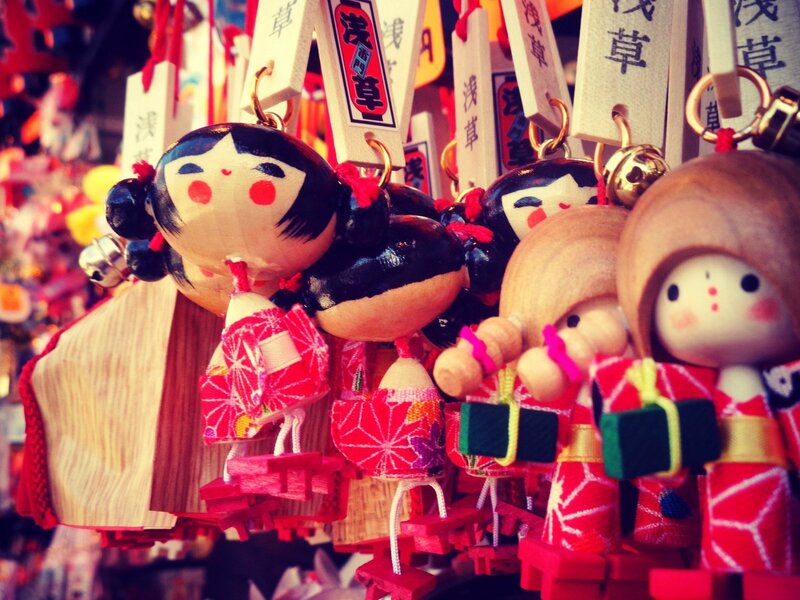 Asakusa is also a place where you will still meet craftsmen and artists who create traditional Japanese clothes, accessories or toys. 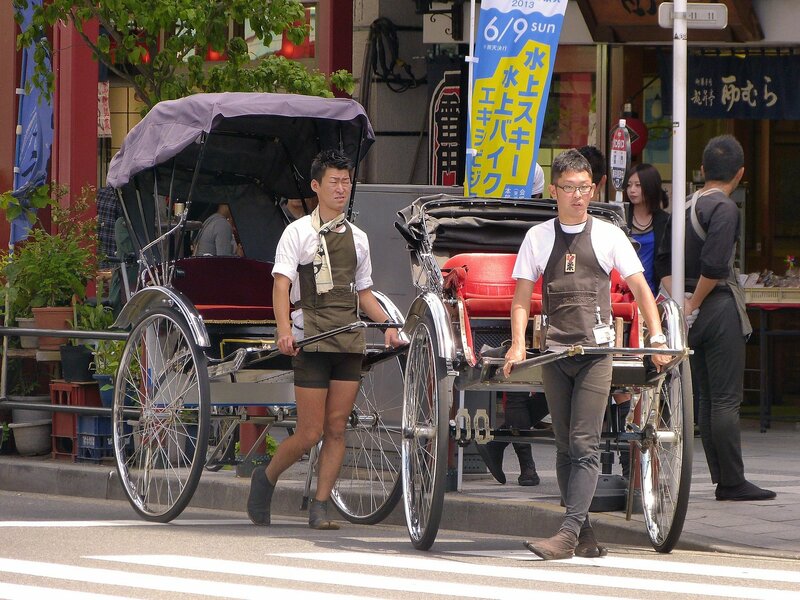 And if you do not want to walk, then you can visit Asakusa with a rickshaw. There is also a lot of kimono rental shops. Among the tourists it is popular to explore the area in traditional costumes and by rickshaw. The fiancés and newlyweds also likes it. Couples from all over the world come to Asakusa for photo sessions. Opposite Senso-ji’s main gate is the Asakusa Culture Tourist Center, where you’ll get all the relevant information about the district. On the top floor there is an observation deck with a view of the district. Asakusa is my favorite place in Tokyo, but each district has its own unique atmosphere and much to offer. It is worth getting lost and walking outside the beaten paths. Then we find the gems that we can not find in any guidebooks, which allow us to get to know the place better and feel its unique atmosphere.